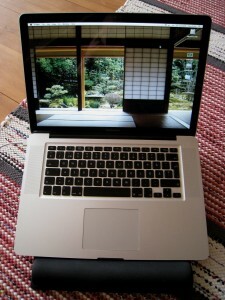 The MacBook Pro with its glossy, reflective screen. Over a month ago, after months of hesitating, I bought a new 15 inch MacBook Pro to replace my old 15 inch PowerBook (titanium version). Before that, I searched and read countless of reviews of it on the web. Now it is my turn to throw in some thoughts about it too. Note that my MBP is not the latest version of the laptop on sell now. The new one has a better screen, integrated battery and a sd card-slot instead of an expresscard. Okay, I’ll jump right into the biggest issue about these new MacBooks that held me back from buying the whole thing for so long: the glossy screen. I’m sure many who visited an Apple store were shocked to notice how heavily these screens reflected the ceiling lights and everything else in practice. It was a real letdown for me every time I examined an otherwise beautifully designed piece of hardware. No matter how tempted I was otherwise, I just couldn’t imagine myself being able to work with such a distracting screen. So I resisted myself from buying one due to the design flaw, hoping that Apple would add an matte option for the 15 inch versions like they did for the 17 inch one. However, I soon just couldn’t continue using my old PowerBook as smoothly as I wished and finally gave in. I grabbed a MacBook Pro and hoped that the reports of getting used to it after some time would prove true. The first two days were tough, as the glossy screen really was as distracting as I feared. What a mirror! At a high brightness level the screen can hide the reflections if the screen is displaying bright colours, but ironically the glossy screen’s areas of “rich blacks” still reveal the screen’s reflections since black ain’t exactly bright enough to neutralize them. It made me think of selling the whole thing right away in protest. But a few days later, I noticed I didn’t bother thinking about it as much. Week or so forward, I didn’t find it as an major issue anymore. In other words, I got used to it. The glossy screen is crisper, brighter and the colours are more vivid than on my old PowerBook, so this was a step into the right direction in the end. And while I’m at home, I would still connect it to my larger external (matte) monitor when doing work that requires as much screen estate as possible. Even on the road (which I’ve been for the past three weeks now), the screen resolution has been big enough not to feel too crammed. Sure, I still have to adjust my working position so that there is nothing bright (like lamps or a window) behind me. Outdoors the screen is quite unusable. And yes, even now I would favour a matte screen over a glossy one. But seriously, it isn’t as bad in use as one might imagine first (unless you use it constantly in very bright surroundings). Okay, enough of the screen. What else is there to point out? The trackpad deserves a special mention as it is a joy to use. The larger size is highly welcomed and although a bit awkward at first, the “tap to click” option (instead of clicking the pad) makes computing a whole lot smoother. Apple was right, there is no need for a separate button with this. The keyboard also feels great, and the backlit feature is a must in very low light conditions. The speakers sound good and the fans’ noise level stay tolerable even when they rev up (which only happens when the laptop performs something intensive). Good thing as a hate noisy computers. And last but not least, the unibody feels very solid in use (only the screen’s plastic hinge feels a bit vunerable). It also runs cool, though it does run warmer when the discrete graphics processor is used instead of the integrated one. I haven’t been clocking the battery performance, but think it has been around 3-4 hours. Good enough, I suppose. Overall after a solid month of use, I can say I’m very satisfied with its performance. It is quiet, responsive, good looking and feels like it won’t brake down easily (though I find it quite annoying Apple doesn’t provide a warranty longer than one year to show some faith in its design). It was an expensive investment, but a required one in order to do serious work on the road. It was a pity that the new version which has an integrated battery and better screen didn’t come earlier, but maybe I’ll try to get the most out of the now dropped expresscard slot (like adding an eSATA connection for external drives).